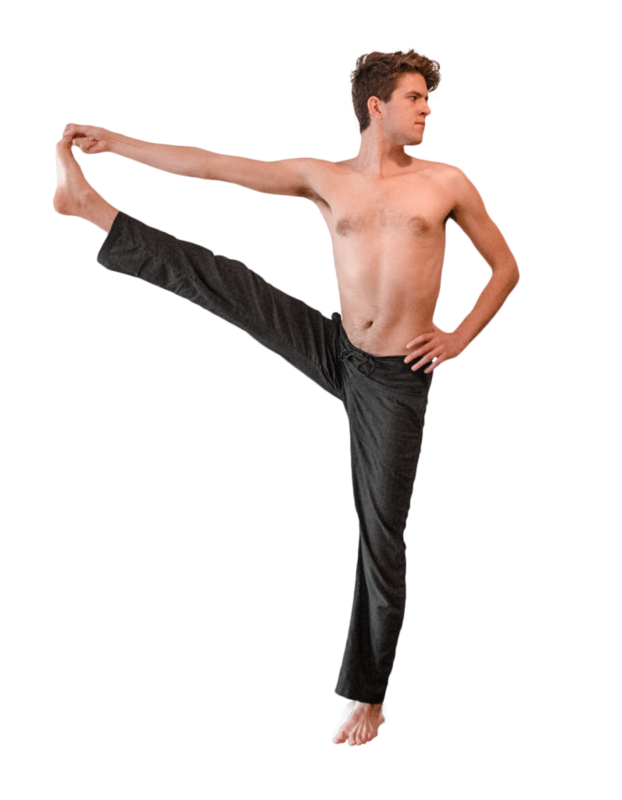 This is the first pose of the Primary Series, performed after all the Standing (Foundational) Poses. This posture has three variations, which are performed in sequence. All three postures challenge your balance, thereby strengthening the left foot and leg (the supporting side) and the abdominal muscles. In the right (uplifted) leg, activity is focused around the psoas, pectineus, and quadriceps. Its effects on these muscles translate to increased stability and ease around the lower back and through the pelvis. The first position strengthens the psoas, pectineus, and quadriceps in a very shortened position while also challenging the balance by shifting the weight forward over the leg. The second position then stretches these same muscles by bringing the leg out to the side. The third position isolates the right hip/leg/abdominal muscles for strengthening. Utthita Hasta Padangusthasana is one of the best positions for strengthening the legs and internal abdominal muscles, due to the fact that it is very challenging to both strength and balance. The muscles connecting to the pelvis are closely related to lower back health – and so practice of this posture can be very beneficial for cases of discomfort or pain in the lumbar spine. The strengthening of the psoas major is of particular import, as it attaches each lumbar vertebrae to the tops of the inner thigh. In many people, the psoas major is chronically hypertoned, tight and weak. It exerts an unhealthful influence on the position of the lower back, bringing it too deep into the body (lordotic curvature, also known as sway back). This position can correct that influence. Start with Stage 1, or if you’re already experienced with this posture, skip on down to the advanced variation. This position effectively teaches one of the most important lessons of the Primary Series: of how to use opposing forces to create stability and lift. Beginners attempt to straighten their uplifted leg by moving it forward in space. This creates distortion of the whole posture, as the hips and shoulders shear to try and maintain balance (see common mistake photos). This is balancing in the way that a spoon balances on the edge of a bowl – a slow back-and-forth movement that feels very shifting and unstable. 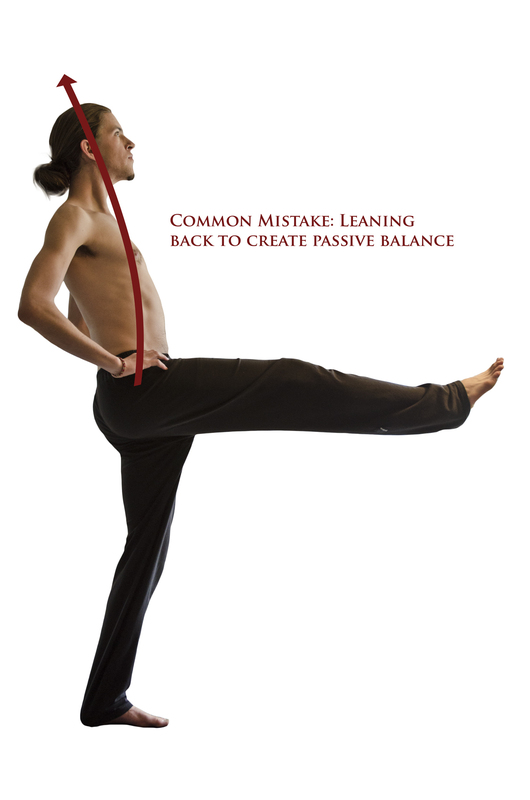 The opportunity given by this posture is to instead create balance through lift. By wrapping the lifted big toe with the first two fingers of the hand and pulling back, you offer the leg some resistance; then extend forward through the root of the big toe. Since the hand and foot are anchored together in space and relatively immobile, the lifted hip will move back in space (towards center of gravity) and the muscles of the hip – the external rotators – and shoulder will be able to fully activate, creating a feeling of solidity and sturdiness. The right shoulder will move back in space and the left shoulder will move forward. In this way, the body will more closely conform to Samasthiti. Instead of wobbling back and forth and struggling to maintain balance, this effort will allow the practitioner to focus on the bandhas & breath, grow taller, extend the standing leg fully and lift the crown of the head upwards. Note: If you’re feeling very unstable here and unable to maintain any of these postures for 5 breaths, use a wall for support. Face along the length of the wall, then bring your left hand to press into the wall. Practice with the wall until you strengthen sufficiently. From Samasthiti, inhale and press the left hand into the left hip as you bend the right knee and draw it up towards the chest. Reach to grasp the right big toe with the first two fingers of the right hand. Attempt to pull your foot to meet your chest, pulling the right shoulder back into its socket and strengthening the right arm. Without relaxing the effort of the arm, press through the through the right and left big toe mounds simultaneously to straighten the right leg as much as possible. Hold this position for 5 breaths. Exhale and take the right leg out to the right side. Make this movement from the right leg alone, without letting the pelvic girdle turn to face right. Stop and hold at the point that the movement starts to come from the hips rather than the leg. Keep the right hip dropping and in line with the left. Attempt to roll the thighbone up and back (rotating the femur externally). Do not relax the resistance of the right arm – there should be a firm counteraction between the foot and hand. Inhale, bring the leg back to center. Exhale, grasp behind the knee with both hands, point the toes, and lift the leg as high as you can. Inhale, release the leg, keeping it elevated under its own power as the hands come to the hips. Exhale, release the leg and come back to Samasthiti. Repeat these positions on the left side. From Samasthiti, inhale and press the left hand into the left hip. Keep the right leg straight as you lift it until it’s parallel to the floor. Reach to grasp the right big toe with the first two fingers of the right hand, pull the right arm back into the shoulder socket, then straighten both legs as much as possible by simultaneously pressing through the right and left big toe mounds. Lift the crown of the head to the ceiling, elongating the spine. Exhale and fold forward over the right leg; fold from the pelvis not the upper body. Lengthen the spine along the right leg. Inhale and return to an upright position keeping your grip on the toe (as pictured above). Exhale and take the right leg out to the right side. Make this movement from the right leg alone, without letting the pelvic girdle turn to face right. Keep the right hip dropping and in line with the left. Attempt to roll the thighbone up and back (rotating the femur externally), but make sure the toes stay upright. Keep pressing out through the mound of the big toe and pulling back with the right hand. 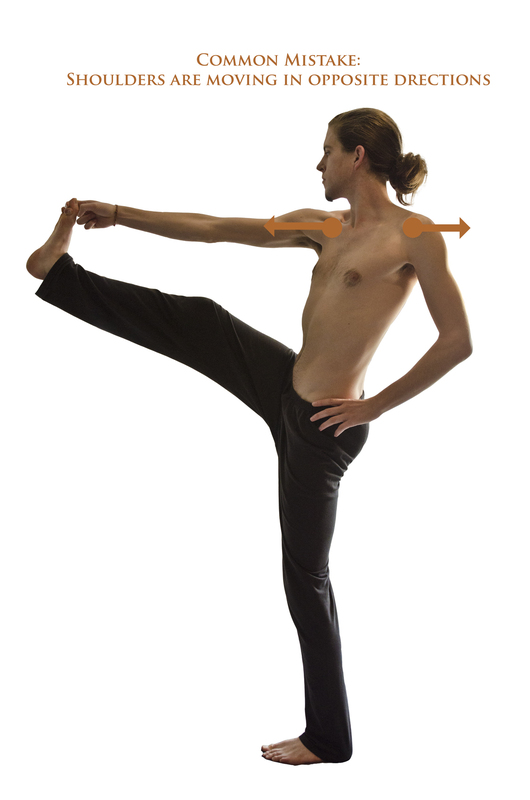 Inhale and bend the right elbow to draw the leg upwards. Ensure that this movement is coming from the leg and not the hips (see common mistakes below). Look over the left shoulder. Exhale, and lift the leg as high as you can. Bring your forehead to the shin. Inhale, release the leg, keeping it elevated under its own power as the hands come to the hips. Keep lifting the right leg, and also focus on straightening the left leg, lifting the left hip, and lifting the entire upper body towards the ceiling, lengthening the spine. Without this effort, this posture will quickly slump and deteriorate. Often, the body will attempt to use your weight, rather than your muscles, to balance. This means that the right (uplifted) arm is drawn forward by the weight of the leg while the left shoulder and left side of the torso fall back to shift your center of gravity backwards. This same position viewed from the rear shows another imbalance. The right hip is lifting while the left hip is dropping downwards. This is created by tightness in the hamstrings – the right leg is dragging the hip up with it. 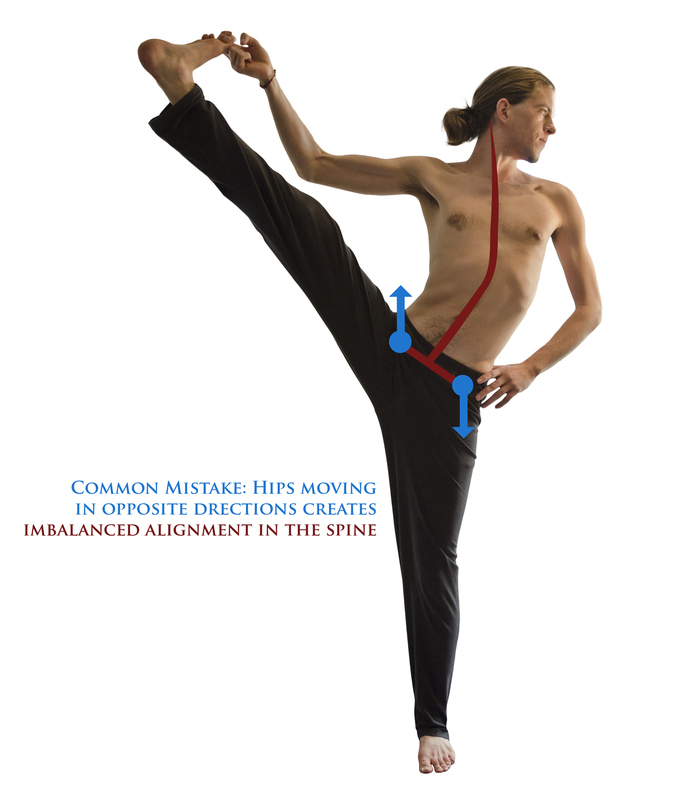 As the hip rises, the spine bends laterally to make room for the hip. The right side of the torso shortens while the left side lengthens. Correct for this by dropping the right hip down towards the mat. Lift the left hip upwards. Breathe into the right side of the rib cage to aid expansion and lengthening. As you lift the right leg, it should articulate in the hip socket; the hips should not move from their neutral positioning. 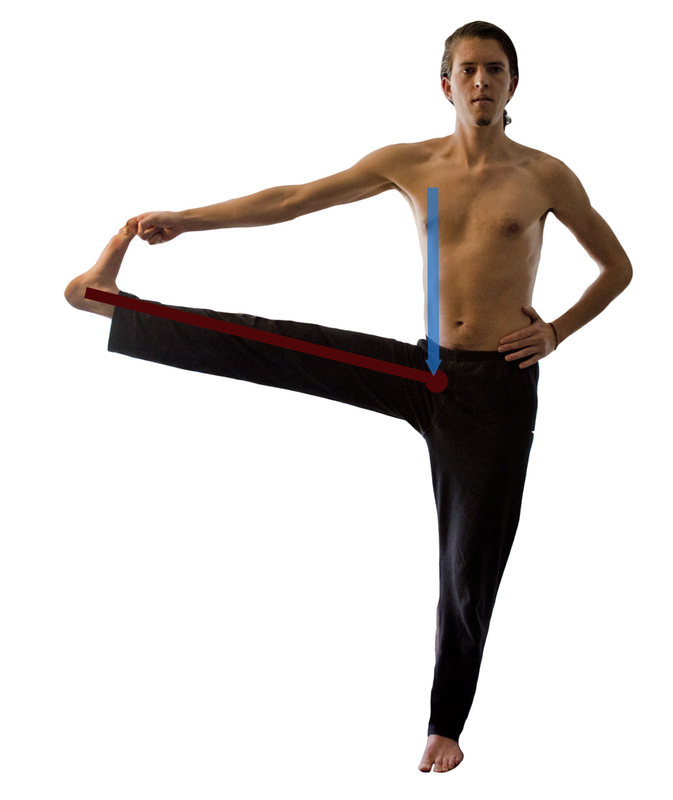 If tightness is extreme, you may be unable to equalize the hips while grasping the big toe. In this case, hook a strap around the ball of the right foot to allow yourself a more upright posture. As your flexibility and strength improves, walk the hand along the strap until you’re able to grasp the toe. Ensure that the movement of forward folding originates from the pelvis rather than the upper body. Curling down from the rib cage will close the upper body and freeze the pelvis and lower back in an upright position. You’ll lose a valuable opportunity to challenge balance and strengthen the internal abdominal and pelvic muscles. In this photo, the right hip is rising upwards while the left is descending. This creates a lateral bend in the spine. 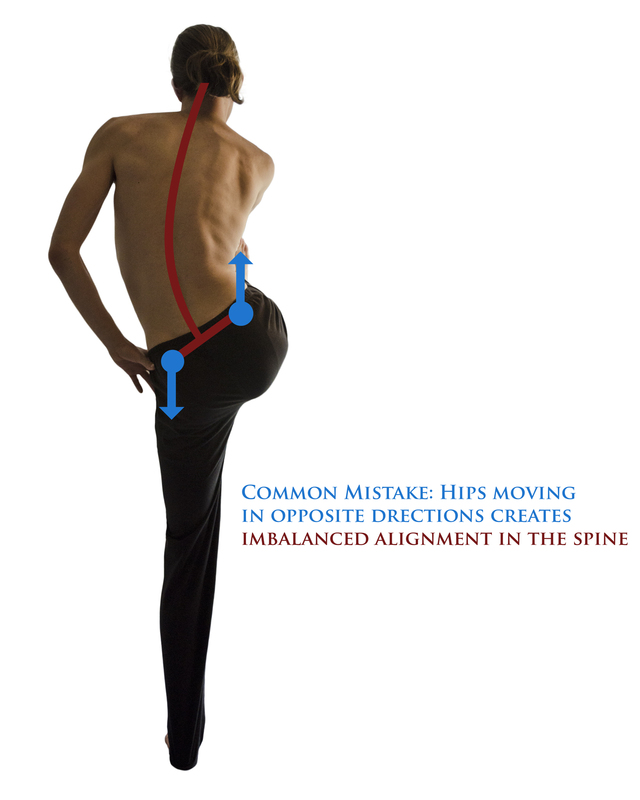 As in the A variation, this is caused by the hip becoming “stuck” with the leg. The action of lifting the leg has been dissociated to the hips instead. This is often the result of just focusing on bringing the foot as high as possible, which the body achieves by lifting the hip higher. To correct, come back to neutral. Lengthen the right side of the body by pressing down into the right hip and lifting the left hip upwards. As you lift the right leg upwards, keep pressing the right hip downwards to resist the upward motion of the leg. As discussed previously, the importance of creating resistance between the big toe and fingers cannot be overemphasized. This photo shows leaning backwards as the body tries to lift the right leg by shifting the center of gravity backwards and lengthen the psoas/pectineus/ quadriceps (these muscles often cramp at a shorter length until they’ve been strengthened sufficiently). Correct by pressing the sternum forward towards the leg to bring the torso upright, then use the bandhas to lift the whole upper body towards the ceiling. Press out through the right foot as if pressing into a wall to engage the external hip muscles and consolidate your center of gravity. If the muscles of the thigh begin to cramp, keep your torso upright and bend the knee slightly.